HAMILTON, Ontario, Canada -- Single person submersibles have been called in to help scientists retrieve samples from a lake in northern British Columbia that may hold vital clues to the history of life on Earth and on other planets. 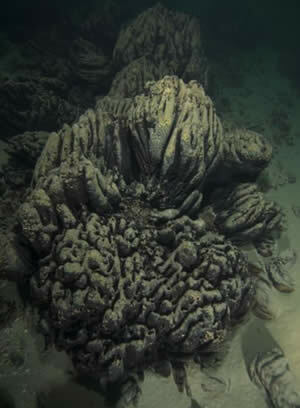 Greg Slater, an environmental geochemist in the Faculty of Science, says the objects of scientific interest are unique carbonate rock structures, known as microbialites because they are covered with microbes. Some of these microbialites grow at depths up to 180 feet below the water's surface, too deep to reach by non-decompression SCUBA diving. "Are they the result of biological or geological processes? Why are there different microbes living on them and how long have these microbial communities been preserved? These are some of our big questions," says Slater, who joined the international team researching these curious specimens three years ago. Last fall, the project received welcome support from Nuytco Inc., manufacturer of single-person Deepworker submersibles, who offered two subs to enableresearchers to finally collect samples of the deepest microbialites. The dives will begin June 23. "It's going to help us develop a baseline of understanding about life on our planet," says Slater. "As amazing as it sounds, the bottom of a lake can answer lots of questions about life on Earth. And how we explore this Lake will lay the groundwork for how we will explore Mars." Astronaut Dave Williams, now a professor of surgery at McMaster University, will also participate in the research at Pavilion Lake. Trained as a Deepworker pilot, he is interested in the similarities between field scientific activities in the submersible and using a lunar rover for geological research in future missions sending astronauts back to the Moon. "What's new about the work at Pavilion Lake this summer is the use of advanced underwater exploration technology to enable investigators to study previously inaccessible specimens," says Williams. "Now we're able to use Rover-type subs with robotic arms similar to what is envisioned for exploring the lunar surface." Pavilion Lake is located about 500 kilometres north of Vancouver in Marble Canyon Provincial Park. It was formed by a glacier more than 10,000 years ago, and has for the last decade been the site of several studies into astrobiology.